Elizabeth Arkwright was born in 1894. Her father was the distinguished bacteriologist Sir Joseph Arkwright. She was educated at Roedean School and Lady Margaret Hall, Oxford University. Arkwright left university in 1915 and became a medical student at St Mary's Hospital in Paddington. A socialist, she also worked part-time for the Fabian Research Department, an organisation established by Beatrice Webb. Arkwright had been impressed with the achievements of the Bolsheviks following the Russian Revolution and in April 1920 she joined forces with Tom Bell, Willie Gallacher, Arthur McManus, Harry Pollitt, Helen Crawfurd, A. J. Cook, Rajani Palme Dutt, Robin Page Arnot, Albert Inkpin and Willie Paul to establish the Communist Party of Great Britain (CPGB). McManus was elected as the party's first chairman and Bell and Pollitt became the party's first full-time workers. In 1922 she met the journalist Tom Wintringham. At first she rejected his advances. On 27th May 1923 she wrote: "I shall begin right away by telling you one reason why I so much want to wait a little. It's such a short time since I was in love with another comrade, who did not love me. I determined I would fall out of love with him quickly and, as a matter of fact, I have. But an emotional crisis leaves one dazed." The following week Elizabeth wrote: "I do love you dear Tom, my self-doubt and hesitation are melting away so fast." Soon afterwards she arranged to stay the night with Wintringham: "Do I have to bring a nightdress? I look much better in pyjamas!" Later she wrote: "I am making some silk pyjamas. I'm going to make them without any buttons because it's so much easier; but that wouldn't do for you would it!?" The couple were married in 1923. The following year Elizabeth spent time with Rose Cohen in Moscow. Tom Wintringham had a reputation as a great womanizer and in 1925 he left Elizabeth for another woman. Wintringham's biographer, Hugh Purcell, wrote in Last English Revolutionary (2004): "He tarnished his political career by a private scandal, thus setting a precedent he was to follow more than once in the years ahead. Although he had only been married for two years, he separated from Elizabeth and carried on a passionate but short-lived affair with another member of the Party." After coming under pressure from the leadership of the Communist Party of Great Britain Wintringham returned to Elizabeth. On 4th August 1925, Tom Wintringham and 11 other activists, Jack Murphy, Wal Hannington, Ernie Cant, Harry Pollitt, John R. Campbell, Hubert Inkpin, Arthur McManus, William Rust, Robin Page Arnot, William Gallacher and Tom Bell were arrested for being members of the Communist Party of Great Britain and charged with violation of the Mutiny Act of 1797. The Communist Party of Great Britain decided that William Gallacher, John R. Campbell and Harry Pollitt should defend themselves. Tom Bell added: "their speeches were prepared, and approved by the Political Bureau (of the CPGB). To challenge the legality of the proceedings Sir Henry Slesser was engaged to defend the others. During the trial Judge Swift declared that it was "no crime to be a Communist or hold communist opinions, but it was a crime to belong to this Communist Party." John Campbell later wrote: "The Government was wise enough not to rest its case on the activity of the accused in organising resistance to wage cuts, but on their dissemination of “seditious” communist literature, (particularly the resolutions of the Communist International), their speeches, and occasional articles... Five of the prisoners who had previous convictions, Gallacher, Hannington, Inkpin, Pollitt and Rust, were sentenced to twelve months’ imprisonment and the others (after rejecting the Judge’s offer that they could go free if they renounced their political activity) were sentenced to six months." Tom Wintringham, Jack Murphy, Ernie Cant, John R. Campbell, Arthur McManus, Robin Page Arnot, and Tom Bell was released from Wandsworth Prison at 8.15 a.m. on 11th April 1926 and was met by Elizabeth and Rose Cohen. According to Rajani Palme Dutt: "Workers tramped from districts in every direction from the early hours of the morning, even fifteen miles through the London streets. Banners had been constructed bearing slogans of the fight, demanding the release of the remaining five prisoners and unity behind the miners... The drama reached its culmination outside the prison gates. The released Communist leaders shouted greetings through megaphones to those still imprisoned within. The cheers of 25,000 workers and the singing of the Internationale pierced the prison walls. The police took names and addresses of the tableaux actors and issued summons. Mounted police drove into parts of the procession causing injury." 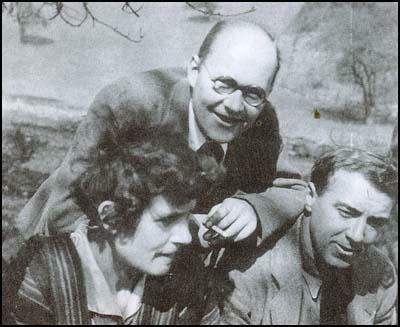 Tom Wintringham, Elizabeth Wintringham and Harry Pollitt. In 1926 Elizabeth and Tom Wintringham moved to 51 Wilson Road in Camberwell Green. Soon afterwards Elizabeth heard that she had passed the LRCP and MRCS exams and could now practise as a doctor. However, she did not find work and the couple existed on Tom's salary as a journalist on Workers' Weekly. Later, he became editor of The Worker, the official journal of the National Minority Movement, a Communist-led united front within the trade unions. On 13th November 1927 their first son was born, Robin, named after their friend Robin Page Arnot. He died in his cot six months later. After moving to 20 Warren Avenue, East Sheen, their second son, Oliver, was born on 18th March 1929. Later that year Tom Wintringham began an affair with Millie, a worker with the CPGB. In 1930 he deserted Elizabeth and Oliver to live with Millie. In September 1931, Tom's third child, Lesley was born. Millie also changed her name to Wintringham by deed poll. Elizabeth wrote to Tom during this period: "I know you are having a mouldy time. Don't think of me as someone you have hurt, but I am so utterly sure that Millie cannot give you more than passing happiness that it terrifies me to think of you tying yourself up only to have this sort of experience again." However, in May 1932, Tom returned to Elizabeth and as a result Millie was forced to put Lesley into a children's home. 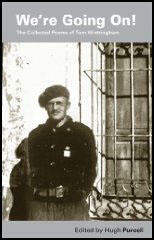 In 1936 Tom Wintringham was sent to Spain to cover the Civil War. While in Barcelona in September he met an American journalist Kitty Bowler. She later recalled: "I wandered over to the cafe Rambla feeling desolate and forlorn. Like the story book waif, who peeks through frosted panes at the happy families gathered round the fireside, I eyed the little group at a corner table... All conversation stopped. Blankly and coldly they looked at me as only the English can. Then a soft-voiced bald man touched my arm: "You must join us." Soon afterwards Wintringham began an affair with Bowler. Sinclair Loutit, who was with Tom Wintringham at the time, later pointed out: "Kitty was a neat, active, progressive, American girl who had nipped across from France to see what was going on and maybe to make a name for herself." Wintringham's biographer, Hugh Purcell, wrote in Last English Revolutionary (2004): "While Tom and Kitty were falling in love they were also exploiting each other. She used him to guide her apprentice journalism; he used her as unofficial secretary and messenger." In October 1936, Wintringham joined the International Brigades at their base in Albacete. He wrote to Kitty that the medical commission had marked him fit for service and that he would probably go to the Officers' Training School as an instructor but was keen to get to the front-line as soon as possible. His first job was as machine-gun instructor to the XI and XII Battalions. He told Kitty: "I'm blooming with uppishness at having vicious little guns to learn and handle... Think of me with my devil-guns. There's a certain exact, free of frills sensible beauty about a good piece of engineering." Ralph Bates, a writer based in Spain, sent a highly critical report to Harry Pollitt about Wintringham and his relationship with Kitty Bowler. "Everyone here was very disappointed with Comrade Wintringham. He showed levity in taking a non-Party woman in whom neither the PSUC nor the CPGB comrades have any confidence to the Aragon front. We understand this person was entrusted with verbal messages to the Party in London. We are asked to send messages to Wintringham through this person rather than the Party headquarters here. The Party has punished members for far less serious examples of levity than this." Kitty Bowler arrived back in London with a message from Tom Wintringham. Kenneth Sinclair Loutit was in the CPGB offices at the time: "She bounced in as the dawn, looking as bright as a new dollar and bringing an unaccustomed waft of Elizabeth Arden fragrance through the dusty entrance." Bowler asked for Harry Pollitt but he was out and was instead seen by Rajani Palme Dutt and John Campbell. Loutit commented: "She saw Pollitt later but the damage was done. Tom had sent back a bourgeois tart - a great talker, some said she clearly had Trotskyite leanings... It must not be forgotten that Tom had a wife of deadly respectability and unimpeachable Marxist propriety." Kitty Bowler claimed that she asked Harry Pollitt to send Tom home. According to Kitty he told her to "tell him to get out of Barcelona, go up to the front line, get himself killed to give us a headline.... the movement needs a Byronic hero." However, many people who knew Pollitt well claim that he would never had said such a thing. On 13th February, 1937, Tom Wintringham was hit in the thigh while trying to organise a bayonet charge. Fred Copeman later commented that George Aitkin and himself found Wintringham sitting behind an olive tree: "Well, we knew he shot himself." This is refuted by Aitkin who confirmed that he had been shot by the enemy. Elizabeth wrote to Tom in hospital: "When I tell him (Oliver) that he must be proud of his father fighting the fascists he clenches his fists and looks so serious and fierce I could weep." She then added: "You are indeed having a lot of varied experience, but shall I know you when you come back? I shall be most anxious to make your acquaintance you may be sure." Kitty Bowler visited him in Pasionaria Military Hospital and discovered he was suffering from typhoid and a form of septicaemia. Patricia Darton, a nurse with the International Brigades, later commented: "I poked around with a pair of scissors and found he had a lot of pus in his wounds which had been sewn up too tightly. And that was it; he got better very quickly." Elizabeth wrote to Kitty to thank her for looking after Tom. "How perfectly splendid you have been! Is Tom sensible at all, or rambling all the time? If it's possible please give him my love and Oliver's. If he seems inclined to worry about Millie and Lesley assure him they are being looked after. You may know who they are. I shall hope very much to meet you someday before long." Kitty Bowler was arrested by the Comintern police on 2nd July 1937 and she was expelled from Spain. She moved back to the United States. On 17th July 1937 Tom Wintringham wrote: "My dear, the party, our party, yours and mine, is sometimes hard on individuals. But look at the job of work it does as a whole and there's nothing like it on earth or ever has been." Tom Wintringham rejoined the XV Brigade on 18th August 1937 as a staff officer. He was immediately sent to the Aragon front and during the Battle of Belchite on 24th August he was shot in the shoulder while attempting to capture Quinto. He wrote to Kitty: "A bullet through the soldier, cracking a bone or so. Lost a lot of blood. I love you. Being away from you hurts more than silly bullets." Dr Alex Tudor-Hart, a member of the CPGB who was providing medical care for the British Battalion, told him that his shoulder bone had splintered and this extended almost down to his elbow. This became infected and after two operations in Spain he was sent home to England. Kitty immediately left the United States and the two of them set-up home in a flat in York Street, London. Tom's younger sister, Margaret, wrote a letter to Kitty Bowler: "I'm afraid I think it's rather a pity that you have come to London. I have grown to love and admire Elizabeth - I think she is a very good person... I know that the Party was pretty annoyed with him some time ago and the Millie-Elizabeth situation has been a source of embarrassment to Harry Pollitt. One or two people back from Spain have spoken of Tom's affairs as a joke, which is intolerable. So you see I must take sides against you." Margaret Wintringham also wrote to Tom about his behaviour: "You simply can't get away with all this irresponsibility. Granted you have to abandon two sets of families, you might at least spare them minor anxieties. You could spare Elizabeth the small humiliation of ringing up the hospital and being asked if she would like to speak to Mrs Wintringham. You know you have a strong faculty for inspiring affection but I repeat, you can't get away with things like this." Tom refused to go back to live with Elizabeth Wintringham and continued to live with Kitty Bowler at 30 Arundel Square, London. 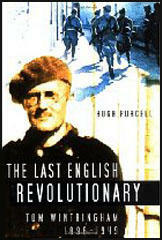 He also began work on English Captain, a book on his experiences of the Spanish Civil War. Elizabeth Wintringham left the Communist Party of Great Britain over its policy towards Nazi Germany. As John R. Campbell, the editor of the Daily Worker, argued at the time: "We started by saying we had an interest in the defeat of the Nazis, we must now recognise that our prime interest in the defeat of France and Great Britain... We have to eat everything we have said." In 1939 Elizabeth Wintringham and her son Oliver left London to live in Derbyshire. Oliver attended Abbotsholme School. On 12th February 1940 Elizabeth petitioned for divorce. Tom Wintringham married Kitty Bowler at Dorking Registry Office on 25th January 1941. During the Second World War Elizabeth worked for the Blood Transfusion Service and then the Family Planning Association. Tom Wintringham died while helping with the harvest on his sister's farm at Searby Manor in Lincolnshire on 16th August 1949. The post-mortem showed that Tom died of a ruptured aneurism of the right coronary artery. Elizabeth's son Oliver told her about her former husband's death. She replied: "Thank you for telling me but, you know, I lost him long ago." Elizabeth later married the theatre critic, John Dover Wilson (1881-1969). Elizabeth Arkwright Wintringham Wilson died in 1975. Elizabeth's first letter to Tom, written on 30 January 1923, ends rather tartly: "Yrs, Elizabeth Arkwright (with a 'z' please)". She soon sent him a photograph: "If the enclosed photograph is any good you may keep it. Esther Tabrisky took it and thinks it's good, but really I was putting on a face as the sun was in my eyes." It shows a thin young woman, her dark hair cut in the fashionable gamin style, wearing an elegant tea dress and squinting at the camera. Four years older than Tom, she was a member of the Labour Research Department and a medical student at St Mary's Paddington, having left Oxford University without a degree in 1915. She was a founder member of the Party too, most probably the only one with the impeccable private education of Roedean followed by Lady Margaret Hall, Oxford. Her father was the distinguished bacteriologist Sir Joseph Arkwright, who had made his reputation with a book called The Louse. Despite her non-political and upper-middle-class background (she once told her son Oliver, "I suppose we are upper working class"), she was a loyal though unassuming member of the Holborn branch of the Communist Party. A few days later the first drip-dry cotton any of us had ever seen was hanging in the Grañen hospital garden. It belonged to an American free-lance journalist called Kitty. She dressed smartly and neatly in practical "sporty" clothes. She had come to have a look at us, because Tom Wintringham had told her that there was a good story waiting to be written on the Huesca front. She later became Kitty Wintringham; by 1938 their coming together was to result in Tom being expelled from the British Communist Party. Tom's fault was maintaining personal relations with elements considered undesirable by the CPGB which dated from the very week of my baptism of fire. It was the arrival of Kitty that did it. Tom was only fifteen years older than me, but I had read very widely and was in some ways older than my own twenty three. This meant that we could talk together on a plane that helped us both. Tom's conclusions, after a few weeks of Spain, were clear-cut and definite. In war, as in boxing, amateurs can only win a fight against professionals by scoring a knock-out in an early round. In the case of Spain, the amateurs were not making a full-time job of fighting the enemy; they were taking time off for fighting each other. The rivalry of PSUC and the FAI was ruinous. The foreign volunteers were tragically amateur. Who could imagine that the Thaelmann Centuria Germans were from a great military nation? They had good morale, they were risking their lives, but their lines were a slum and all military initiative was left to the enemy. Tom wrote a paper in September 1936 suggesting that international volunteers must show real military expertise. To use foreign volunteers for their journalistic impact on non-Spanish public opinion might be politically useful, but such amateurs would not change the military position. He wanted the Central Committee of the British Communist Party to reach a mature appreciation of the military position because he thought that the working-class movement's current reaction to the Civil War was altogether lacking in realism. For Tom Winteringham, the Popular Front should be showing professionalism in military matters. International military assistance should be as professional as was the medical assistance. He was asking for an International Brigade of ex-servicemen. He got Kitty to take his report back to King Street (the CPGB H/Q) where she was to put it directly into the hands of Harry Pollitt, the Secretary General of the British Communist Party. The risk of mailing it from Spain was certainly far too great, but the choice of Kitty as a courier for this 'high security' tract was in fact a tactical error. Kitty was a college-girl archetype - leggy with a swinging walk, bottom in and bust out even though she did not have much of either. Her quick-fire, clear, zesty, American speech came out of a neatly lipsticked mouth which was set in a young self-confident face. I suppose she was then just less than 30 years old. So Kitty hurtled back to London arriving at Victoria Station early one morning feeling pretty beat up. She wanted to do a good job for Tom. Her background told her that a beat-up girl does not get as good a hearing as one who looks on top of the world. For a good hearing in King Street in 1936 this was a wrong. Led by her mistaken intuition, Kitty went straight from Victoria Station to the Bond Street Elisabeth Arden and gave herself the works: sauna, full facial, hairdo, and no doubt put on a clean drip-dry swirly skirt. On the top of her form, she took King Street by storm. She certainly laid them all flat, but with the wrong emotions. A month or so later I had her side of the tale; she said that only one person in King Street knew how to smile but he worked with a sour-puss. They were glad to get Tom's report, but they did not seem to want any discussion. She also had taken the chance to tell them that they ought to make better financial arrangements for Tom in Spain, as he was quite evidently short of money. A secondary source later indicated to me that Tom's lawful wedded wife, a party-member of standing, had been in King Street on the morning that Tom's dispatch was delivered. Kitty's mere presence, to say nothing of her Elisabeth Arden aura, must have served to confirm all the earlier traveller's tales. In those days a certain greyness, a quakerish sobriety, an evident renunciation of the superfluous, was reckoned as becoming to females with Party links. Poor Kitty must have exemplified the very licentiousness of the class-enemy, the bourgeoisie. Tom had certainly chosen Kitty as courier because he knew that she would get there, through Hell or high-water, without fail. What he failed to see was that her appearance, and her frank drive, would serve to weaken the force of his dispatches. He had not yet come to grips with Stalinist mediocracy; a characteristic so well demonstrated by O'Donnel.